Exercise care to avoid violation of the provisions of 38 CFR 3.951 and 38 CFR 3.952 for compensation and pension disability benefits. Do not reduce an individual disability evaluation that has been continuously rated at or above the current level for 20 years or more except in the case of fraud per 38 CFR 3.951(b). Measure the 20-year period of 38 CFR 3.951(b) from the earliest effective date of the combined or individual evaluations. Note: For purposes of determining whether benefits were received for a continuous period of 20 years, include periods during which recoupment or deduction applied to an award. The protective provisions of 38 U.S.C. 110 and 38 CFR 3.951(b) do not require a concurrent award of monetary benefits. An evaluation for compensation purposes that has been continuously in effect for 20 or more years is protected whether or not the Veteran elects to receive the compensation. Ratings for other than compensation purposes, such as ancillary benefits. If a retroactive increase under 38 CFR 3.105(a) results in a Veteran having been rated for 20 years or longer at a certain level, the evaluation is protected under 38 CFR 3.951(b) and may not be reduced in the absence of a showing of fraud. Do not reduce benefits when a combined evaluation has been in effect for 20 years or more except in the case of fraud. Both the individual evaluations and the combined evaluation are protected under 38 CFR 3.951(b), even if erroneously assigned. An improperly assigned combined degree of 50 percent has been in effect for 20 or more years. Protection under the provisions of either 38 CFR 3.951 or 38 CFR 3.952 of a total rating or disability evaluation does not preclude reduction to a hospital rate under 38 CFR 3.552. Public Law (PL) 102-86 states that a rating evaluation cannot be reduced solely because of a change to the rating schedule subsequent to August 13, 1991. However, 38 CFR 3.952 protects rating evaluations under the 1925 rating schedule which were the basis of compensation on April 1, 1946. Note: Evaluations in effect when previous changes to the 1945 rating schedule occurred are not protected by PL 102-86. When reviewing a disability evaluation after a change in the rating schedule, determine whether the current evaluation would be continued or decreased under the prior schedule. Note: The disability evaluation cannot be reduced unless you can show the Veteran’s condition improved enough to have warranted reduction under the prior schedule. When manifestations of a disability have been evaluated at a particular level for 20 years or more, Rating Veterans Service Representatives (RVSRs) should exercise caution when assigning a new diagnostic code (DC) for symptoms of that disability. RVSRs should consider whether the new DC includes the symptoms protected under the current evaluation or whether the new DC considers separate and distinct symptoms. VA is not prohibited from changing the DC for a protected evaluation if it does not result in a reduced rating for that disability. Example: A Vietnam Veteran has been SC for a through-and-through gunshot wound (GSW) to the right leg (MG XI) evaluated at 10 percent under DC 5311 effective November 21, 1968. The Service Treatment Records specifically indicate that the nerves were not affected. Over 40 years later, the Veteran is granted SC for type II diabetes mellitus. The GSW to the right leg has remained static; however, the medical records indicate that he has diabetic neuropathy with right foot drop. Since both the GSW and the peripheral nerve paralysis (foot drop) affect propulsion of the right lower extremity, separate ratings cannot be granted without pyramiding. However, a single 40 percent evaluation may be granted under DC 8521, which would consider both the symptoms of the GSW as well as the new diabetic neuropathy with foot drop. Esteban v. Brown, 6 Vet.App. 259 (1994). The disability cannot be considered to have been continuously rated during the period in which compensation is discontinued. Reference: For more information on the effects of reentry in active duty on disability evaluations, see VAOPGCREC 5-95. 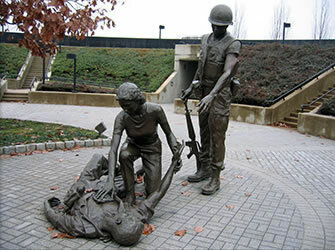 In the absence of the Veteran’s own willful misconduct or abuse of alcohol or drugs, Department of Veterans Affairs (VA) must pay compensation otherwise in order for a disability that was erroneously established as service connected, where service connection is protected from severance. Measure the ten-year period from the effective date of service connection, not the date of the rating, to the effective date of the actual or prospective reduction. Under 38 CFR 3.951(b), do not discontinue a rating of permanent total disability for pension purposes which has been in force for 20 or more years except in the case of fraud. The protection of pension entitlement under 38 CFR 3.951(b) does not extend to Special Monthly Pension (SMP).